We will land in Cuba in the cultural capital of Santiago de Cuba to explore the laid-back provincial city. Santiago has a rich cultural heritage, and is known as the capital of "Son" music, the root of all salsa music (i.e. Buena Vista Social Club.) Then, likely on Monday, January 16th, we will all fly to Havana, Cuba's big city and salsa capital where we will spend the remaining 6 days & nights for a full and intense experience there. You can leave either on Sunday, January 8th or Thursday, January 12th. If your schedule allows, I do recommend the longer version as you will have a much fuller and relaxed experience in Santiago, and will have significantly more time and exposure to learning Cuban dancing. Group dance lessons for 2-3 hours per day for 6 days. (For those who are doing the longer 2-week trip, at least 8 days of dance classes.) And each student will have his/her own Cuban professional dance assistant/partner during each class. Seven nights out dancing in authentic Cuban nightclubs. (9-10 nights for those who are doing the longer 2-week trip.) This includes going out to the best-known clubs of Havana and Santiago to hear and dance to live famous international acts (such as Los Van Van, Havana De Primera, Pupy y Los Que Son Son, Manolito Simonet, Elito Revé, etc.) 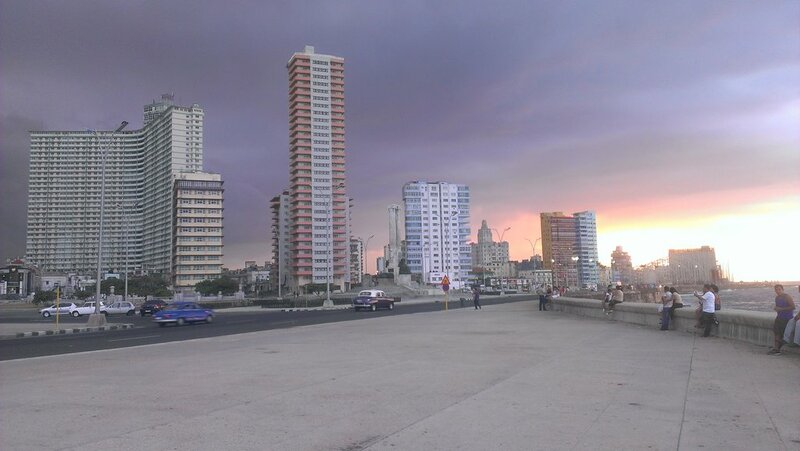 of Havana, and the most well-known Son/Salsa bands of Santiago. In addition to the 7 nights out as a group, you will have the option to go out on all of the other nights as well by paying your own cover for the events. Some nights we will invite some of our teachers and other professional dancers to the clubs, and you will be able to dance with all of them to practice and enjoy dancing all night long. At least one afternoon trip to "Playas del Este" -- a 30-minute drive to the most beautiful beaches in the Havana area. The cost of the full trip is $3,200 (double occupancy), $3,400 (single occupancy) per person. This is for leaving Sunday, January 8th and returning Sunday, January 22nd. The cost of the shortened trip is $2,850 (double occupancy), $3,000 (single occupancy) per person. This is for leaving Thursday, January 12th and returning Sunday, January 22nd. Eric has been traveling to Cuba since 1995. He has traveled there 17 times, and spent a total of over 20 months there. He has studied dance there extensively and has developed numerous connections over the years. Join him to explore and experience the amazing things Cuba has to offer. The focus of the trip will be dancing and music, but the tour includes exploring Cuba's history, architecture, beaches, and their fascinating people. Let me know if you would like me to attempt to match you with another traveler to share a room.